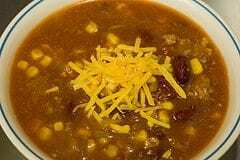 Home » Soup Recipes » Hearty Taco Soup – easy to put together, and tastes great. 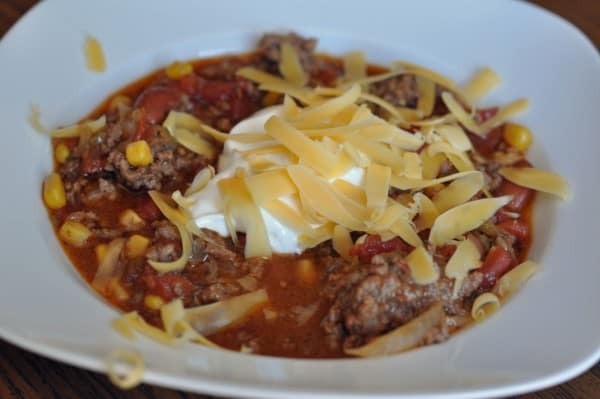 Hearty Taco Soup – easy to put together, and tastes great. If you like Tortilla soup, this is the soup for you. It is a wonderful spicy soup. I like to garnish this with sour cream and chopped green onions as well as cheese. Hearty Taco Soup easy to put together, and tastes great. In large pot brown meat. Drain fat. Mix everything together except pasta and cheese. Bring to a boil, then simmer 5 minutes. Add pasta and continue to simmer until pasta is tender, about 15 minutes. Add more water to adjust consistency, if desired. Garnish with cheese. I have tried this recipe and made some changes when I cook it. I leave out the cayenne pepper and I get the regular Ranch Style beans. My family doesn't like hot, spicy foods. Also, I noticed that the carrots do not get cooked enough in the short time it takes to stew. So I substitute a small can of carrots. I garnish with cheese in individual bowls, not the whole pot. Wow! My wife found this recipe for me and made it at home. I eat it when we go out for dinner all the time . And I always ask her to make It for me all the time . So she finally deciced to surf the web and found this great recipe. I have had her make it for me twice in a week. I need say no more. Thanks for the great Taco Soup recipe.